Quinns: Imagine you and your friends are protecting the earth from meteors, assembling rockets from the cards in your hand. Sounds fun, right? Now imagine you don’t have the right cards for a successful launch. And the clock is ticking and you only have five minutes to clear the board. And now imagine you don’t know how big a payload to launch at each meteor, and if you launch one that’s too big the terrific explosion will accelerate all the other meteors. Oh, yes. 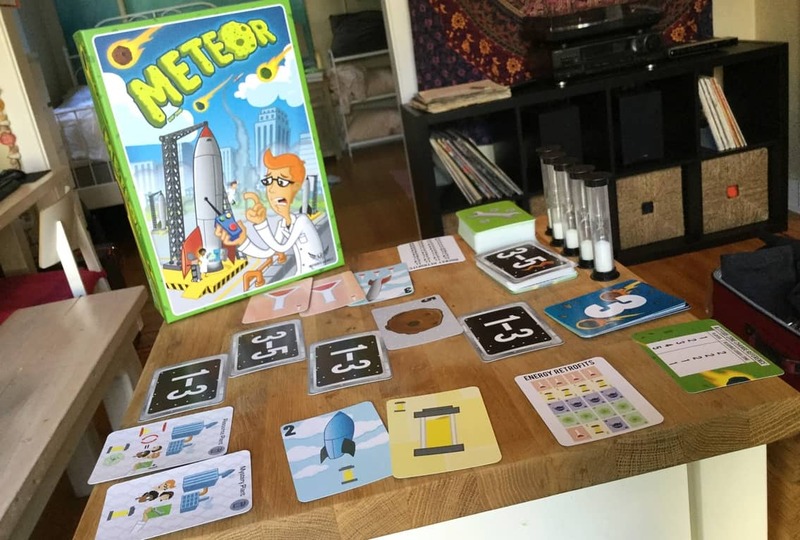 Today we’re reviewing Meteor! 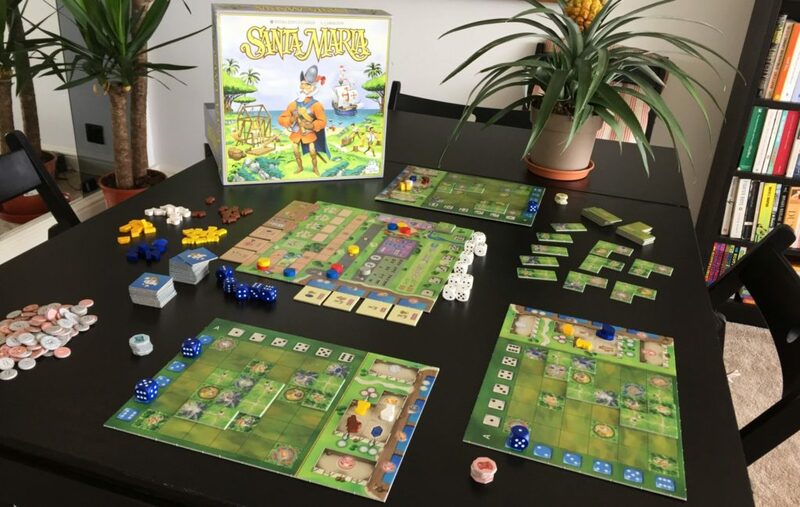 It’s mean, exhausting and the art design ranges from underwhelming to unclear, but it’s a megaton of fun. For what it’s worth, if you like high-fiving people, this box could be considered a cardboard portal to the high-five dimension. Here’s how it works: Each player receives a hand of cards depicting rockets, unlockable technology and “energy”. 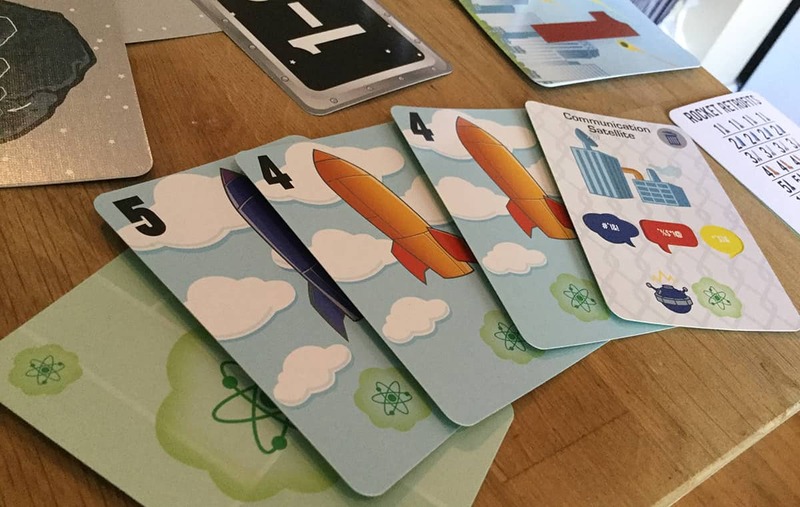 Rockets and tech have requirements printed in the corner, made up of some combination of the four types of energy cards (for example, a rocket might need one red and one yellow energy). 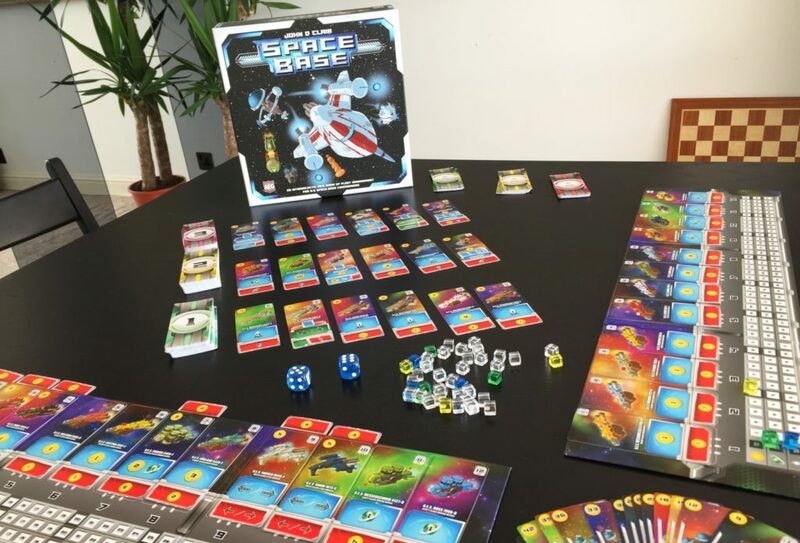 Launching a rocket or unlocking some tech for the table is as simple as slapping that card down, and slapping the right energy on top of it. But maybe you won’t even need to add energy! Since your friends will be watching, they can provide energy cards from their own hands, right on top of your project, and this is huge. Ghost Stories was one of the first reviews we ever did, and in that I said that the best co-op games make you fall in love with your friends again. Meteor has that in spades, which your friends constantly fueling your hail-mary contraptions, unlocking tech or letting you draw cards. It’s worth mentioning that one of these tech upgrades is (wait for it!) the ability for players to talk. Which is, again, vitally important. Because if the best bit of Meteor is finishing one another’s machines, the other best bit is part-filling your launchpad with a jug of red fuel or an empty tech upgrade… and all of your friends shooting you an apologetic glance. They don’t have the other part, or they need it for something else. Or maybe they don’t know how bad you want this? Tap the table! Tap it more! At times Meteor will reduce you to a morse code enthusiast, hammering away at the table and communicating nothing. Best of all, everyone can only assemble one thing on their launchpad at a time, when it launches there can be NOTHING left over, and the only way you have of removing a card once it’s placed (assuming you can’t use it) is to discard everything on the launchpad. In other words, if your friends can’t help you you have to throw everything away, creating a wonderful little trust exercise. Or rather than throwing your contraption away you could wait until the meteors get even closer, and everyone can draw a card again… ! That’s already almost all of Meteor’s rules. I read the manual on a single, dedicated trip to the toilet (don’t try that at home, I’m a professional). The next thing to know about is, of course, the meteors themselves. Do you want the good news or the bad news first? The bad news: Each rocket card and meteor card has a size. If they’re the same size, you blow up the meteor. If a meteor’s bigger than a rocket, the rocket does nothing. 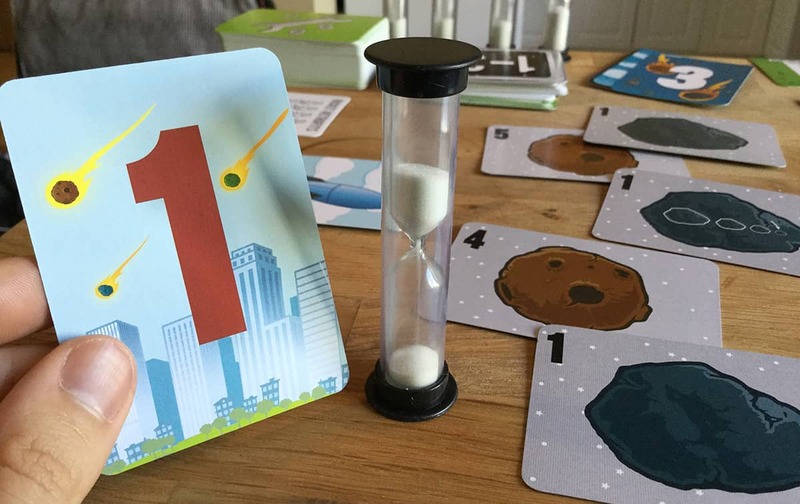 And a rocket that is bigger than the targeted meteor will accelerate the game onto the next 1 minute sand timer (a game of Meteor is 5 minutes, made up of 5 sand timers). The good news: I was kidding, there is no good news. 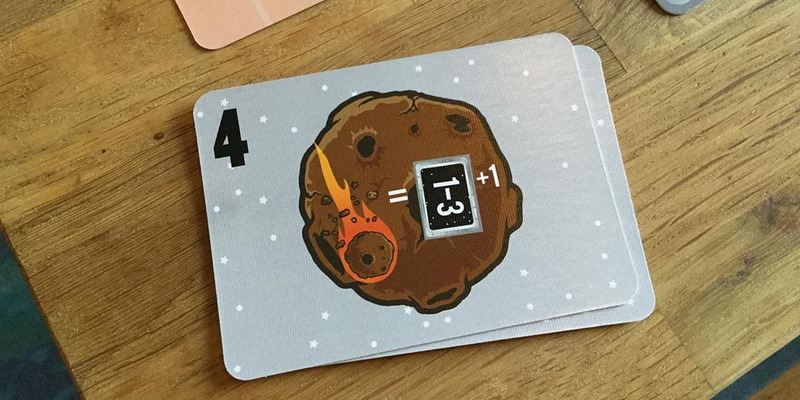 The worse news is that all the meteor cards start facedown, with a guesstimate of their size printed on the back, and you only flip them over after you’ve hit them with a rocket. Careful now! The even worse news: Once you get good at the game, it’s time to add the boss meteors. The final rule, and the one that provides the most room for heroism in the face of that suffocating time limit, is the fact that players can “retrofit” poker hands of fuel or rockets to let everybody draw. So, if you cash in rockets of strength 1, 2, 3 and 4, suddenly everyone can draw a card. Again, this is SUCH a smooth, entertaining dynamic for a team game. Your reward for being really good at Meteor isn’t solving the puzzle for the table, it’s helping everybody else to solve their own puzzles. And that’s it. The rules of Meteor are simple, but criss-cross effortlessly until you realise you’re tangled in a glutinous legal spiderweb. Do you want to play that rocket, or hang onto it for a retrofit? Do you want to leave your tech card gathering dust on the launchpad, or trash it and make room for a different tech card that this time your friends MIGHT be able to power? Importantly, the reward waiting at the end of all this decision-making is sweet. Declaring “Launch!” (the only word you’re allowed to speak), you fire a rocket, you flip a meteor, your friends hold their breath… and it’s just the right size for your rocket! It’s a clean explosion. There’s time for a quick high-five, but the clock’s still ticking. Did I mention that the biggest meteors need to be destroyed by two rockets, meaning two players have to shout “Launch!” simultaneously? I didn’t? Because that’s a perfect bit of game, right there. 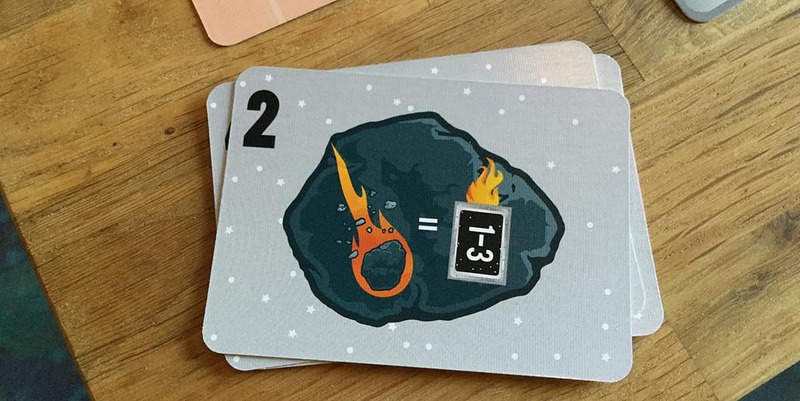 Though if we can say there exists an opposite to a “perfect bit of game”, it is surely the inscrutable iconography on Meteor’s cards necessitating that players turn the current sand timer on its side while they check the manual to see what a meteor does, or a tech card they just drew, or the bonus or penalty card dealt out to one of their friends. It’s a small annoyance, but it’s all the more annoying because it’s so dumb. Maybe I sound like a jerk. Look, what do you think this symbol means? It means “This meteor splits in half,” right? Got that? Incidentally, the above symbol is listed in the manual both as “meteor splits in half” and “radioactive meteor”. That’s a typo. A radioactive meteor is one that kills another, small meteor when you blow it up, and accelerates any that are left. What do you think that looks like? Yes! It looks almost identical to the splitter with a tiny, tiny tail of flame. Anyway, this is only a small annoyance. When it comes to iconography and nukes, the discussion we can and should be having is how we’re going to convey the dangers of nuclear waste to future generations. That’s a much more fun thought experiment! Go read that article, it’s completely awesome. 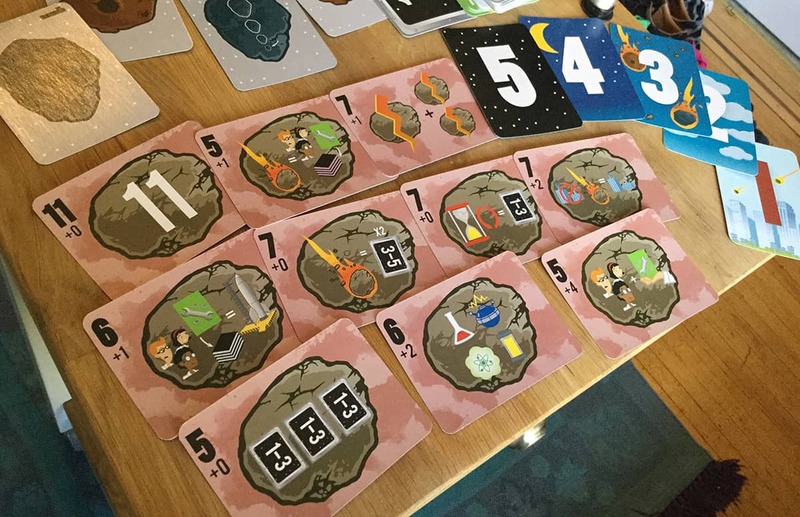 All in all, Meteor offers a fantastic, interesting 5 minute game, packed into a 2 minute rules explanation. 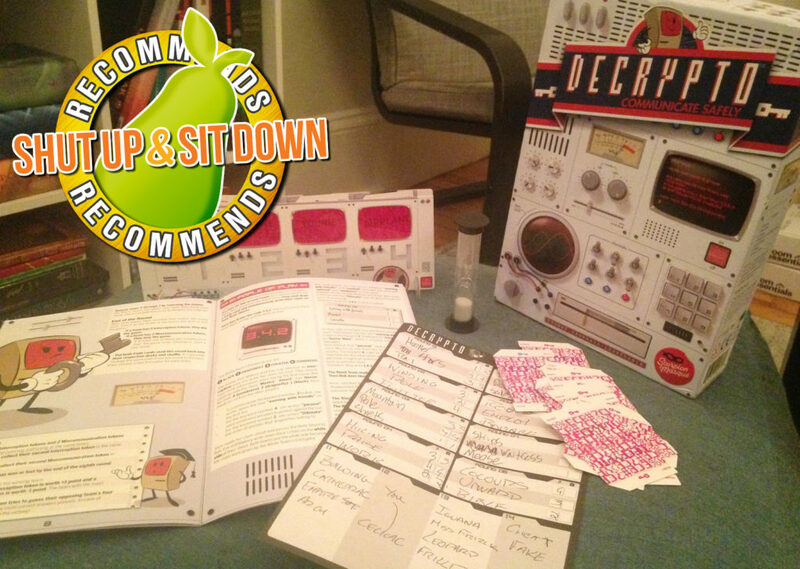 Shut Up & Sit Down can happily recommend Meteor. It’s kind of a sweet counterpart to Hanabi. You’re still working together and fretting about which rockets to fire into the air, but it’s as high-octane as Hanabi is thoughtful. Plus, you can play it by yourself! Shut Up & Sit Down does not recommend playing Hanabi by yourself. But if you do, let us know how it goes.